Milkyway@Home (separation) 0.56 is now available for iOS 4 devices! For some reason they didn't allow this on the app store, so if you want to install it you have to jailbreak. 2. 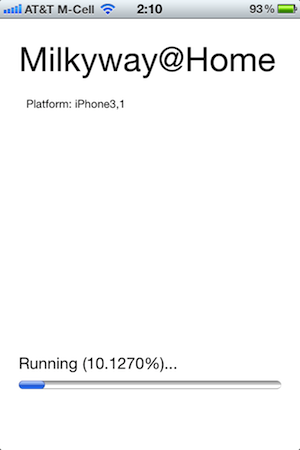 Start Cydia after jailbreaking. Allow it to Upgrade Everything. 4. Search for "Milkyway" and install the "Milkyway" package. The description is "Model the galaxy!" 5. Now, on your homescreen, you will find a Milkyway icon for MilkyWay@Home on your device. Tap it to get started. 6. Tap the "Start" button to begin computing. The device checkpoints if you leave. Message 46881 - Posted: 1 Apr 2011, 7:22:04 UTC - in response to Message 46879. So this was the BIG news?? ehh.. Atleast it wasn't what I was expecting. Message 46883 - Posted: 1 Apr 2011, 12:13:23 UTC - in response to Message 46882. I would hate to see the performance per watt for this, it would be excruciatingly poor. Nice to see some innovation I guess, but is it really worth anyones while running this when a gpu, let alone an x86 CPU (even an intel atom! LOL) would be hundreds of times faster and efficient than an ARM CPU? ............... You guys need to get out more. Message 46964 - Posted: 4 Apr 2011, 22:39:52 UTC - in response to Message 46882. This is not THE big news; we are still finalizing details so I can't say anything more. Message 46966 - Posted: 4 Apr 2011, 23:41:21 UTC - in response to Message 46964. 1. We got rid of the whole cmake crap and other rather strange libraries invonked ??? 2. MW finally figured out that Windows is the top OS (98.99%) and you've put linux and osx developent on the back burner where they belong ? Message 46967 - Posted: 5 Apr 2011, 3:41:48 UTC - in response to Message 46964. Wait, what? So this app is for real? I don't mean to sound like a jerk (and MW@H is one of, if not my favorite DC project bar none), but why on earth would you bother? Message 46968 - Posted: 5 Apr 2011, 4:20:05 UTC - in response to Message 46967. Only sort of. It's as real as can be expected for the minimum amount of work put in for a functional April fool's joke. What actually runs is totally real; it's the same actual separation code. 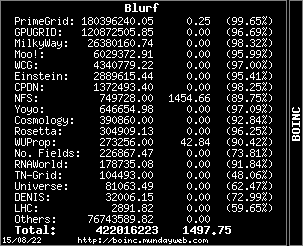 However it's too much work to get the BOINC libraries working on ARM, so properly getting and sending back work doesn't work with accounts and everything. To make it sort of work, it randomly downloads 1 of 5 sample workunits (which are 1000x smaller so they actually can finish in a reasonable amount of time) and then lets you email the results to me at milkyway4ios@gmail.com (which is my favorite part of the whole thing. About 125 people have actually sent results). If given a real, full sized workunit it would actually finish and work, though it would take about 2 weeks by my estimates. Because it's funny, only took an afternoon and I made other people do most of the work. Message 46969 - Posted: 5 Apr 2011, 4:52:51 UTC - in response to Message 46968. BTW, the new announcement wouldn't have something to do with nbody transitioning to GPUs, would it? Message 46970 - Posted: 5 Apr 2011, 5:04:47 UTC - in response to Message 46969. No, that's my next project I'm just starting on. This was just linked on the Boinc forum...I want to confirm it is working on IOS systems? Message 60559 - Posted: 13 Dec 2013, 4:35:36 UTC - in response to Message 60558. It was more of a April first joke, from what I read. Message 60570 - Posted: 13 Dec 2013, 22:26:42 UTC - in response to Message 60558. It's an older piece of software that Matt Arsenault built for fun - I'm pretty sure we haven't been keeping it up to date. If anyone has it working, let us know, but it was my assumption that we aren't supporting it.